Within the past four years, Apple has managed to "dramatically reduce" the rate of iPhone-related repair fraud in its retail stores in China, according to The Information's Wayne Ma. The report is based on interviews with more than a dozen former Apple employees who spoke on condition of anonymity. In 2013, Apple is said to have discovered a highly sophisticated fraud scheme in which organized thieves would buy or steal iPhones, remove valuable components like the processor or logic board, swap in fake components, and return the "broken" iPhones to receive replacements they could resell. Thieves would stand outside stores with suitcases full of iPhones with some of the original components stripped out and replaced with inferior parts, two of the people said. The fraudsters would hire people to pretend to be customers to return them, each taking a device to stand in line at the Genius Bar, the people said. Once the phones were swapped, the actors would pass the new phones to the fraudsters and get paid for their time, the people said. "In the old-school world, this would be a car chop shop, where you would take all the pieces off and sell them," said Kyle Wiens, co-founder and CEO of iFixit. "Now they're doing that with iPhones." The report claims most of the schemes originated in Shenzhen, a southern Chinese city known as a hotbed for criminal organizations because of its proximity to gangs in nearby Hong Kong. Shenzhen is also the largest electronics manufacturing base in the world, home to many Apple suppliers like Foxconn. When the first Apple Store opened in Shenzhen in November 2012, the report says weekly iPhone warranty claims, including repair and replacement requests, jumped from about 200 to more than 2,000 within the first six months—"almost three times more" than Apple's flagship Fifth Avenue store in New York at the time. At first, the report says Genius Bar employees would swap broken iPhones for new ones as long as they didn't appear intentionally damaged, as was the policy elsewhere. But as the problem started to have a material impact on Apple's financial sheet, to the tune of billions, the company began to take further action. Hesitant to get Chinese authorities involved, due to the risks of public backlash and negative publicity in state-run media, Apple launched an online reservation system that required proof of ownership, and later developed diagnostic software that allowed retail employees to quickly detect fake parts in iPhones. Fraudsters found ways to evade these tactics, however, and even went as far as obtaining Apple customer records, including serial numbers, for iPhones that had already been sold in China. Last year, police in China arrested a ring of suspected data thieves involved with the fraud. An increase in rejected warranty claims sparked angry scenes in Apple Stores, the report says, as customers suspected of fraud "grew irate" when their iPhones weren't accepted. Partly for this reason, Apple stopped authorizing iPhone replacements in stores and began requiring sending them to off-site repair centers for inspection. 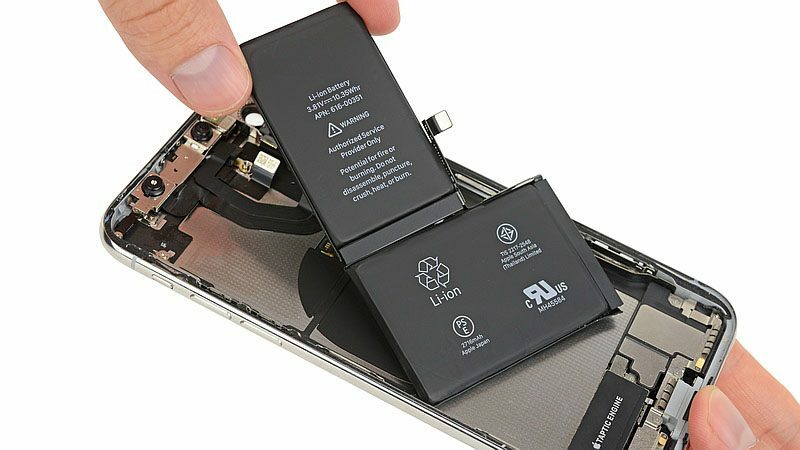 Apple also began dipping batteries in a special dye that could only be seen under a high-frequency light to authenticate them during repairs, the report says. A-series chips in iPhones are also allegedly coated in a waterproof sealant that can be seen under certain wavelengths, offering another countermeasure. Apple's efforts appear to have worked, with fraud rates in the Greater China region dropping to about 20 percent of repair claims from more than 60 percent at its peak, according to the report. Fraudsters are now said to be shifting to Apple Stores in other countries, including Turkey and the United Arab Emirates. LOL this reminds me of my oldest days in the Apple computer repair trade, when Apple accused me of repair fraud! Around 1980, I was a tech at a computer store in Dubuque, Iowa, we sold a lot of Apple ][s and we had an advanced repair kit for aligning disk drives. Most dealers didn't have the advanced repair tools, it required an oscilloscope and seriously advanced computer skills. I re-aligned a lot of Disk ][ units, and I noticed some of them were machines we had sold recently. So I decided to start checking every single Disk ][ that came into the shop. I discovered they were all sloppily calibrated, some of them slightly misaligned. If these drives came in for repair under warranty, or were DOA, I could realign them and Apple would reimburse us for the labor. I would take the case off, put in the calibration disk, hook it up to the oscilloscope, and turn the potentiometer on the controller board until the alignment was perfect, then put the drive back together and pack it back up in the box, better than new. We started to put in for warranty reimbursement on drives I considered out of alignment and basically DOA due to miscalibration at the factory, and assured our customers that our drives were better quality than other Apple stores. They really were! About a month later, we got a call from the Apple regional repair manager. He accused us of fraudulently claiming reimbursement for dozens of disk alignments. I explained it to him, that the products were coming in with sloppy calibration and were out of spec, so we checked them all before we sold them. That did not make him happy at all. We were told that we would not be reimbursed for ANY disk calibration on Disk ][ units that were not repairs from customers. No more presale recalibrations. We pre-calibrated all our Disk ][ units anyway and considered it a free customer service. It prevented a lot of customer problems and avoided repairs in the long run. We spent three weeks in China. The guides said crimes involving fraud, such as selling a Ming Dynasty relic to tourists that was made yesterday, considered a skill. Attacking someone, or crimes against the State, punishable. Outsmarting Apple, a skill, they should be more vigilant in their business practices. Not all places in the world follow our ethical guidelines. I actually felt much more comfortable in China than in major European cities, where people were always warning about pickpockets and thieving gypsies ( I honestly didn’t know that word was still used in normal conversation). The world is full of amazing people, and not so amazing people. i am surprised the peak wasn’t 100%. welcome to china, apple. More reason to want Right to Repair laws in our own country. One of the tenants of R2R is that manufacturers have to offer OEM parts to outside services. A readily available supply of OEM parts would mostly curb black markets like this one. It would just mean even more fake spare-parts. You do understand that just because the ebay auction says "genuine" in the headline doesn't mean the part actually is genuine? And most people would somehow still put the blame on Apple when some 3rd-party repair shop that bought a part for cheap on ebay would brick their phone. Another case of ruining life for honest people. How the hell did they manage to get a third party processor to boot the phone and actually make it usable to show? Right at the embassy in Beijing on Dongzhimenwei Dajie for 4 years. The West still has an ethics system descended from concepts of Christian guilt. Other places don't have this. Canada has suffered greatly from this clash of cultures. Chinese soft power has completely corrupted our political system.